Deep in the Amazon jungle a young American woman and the son of plantation owners fall madly in love. For Tanya and Shannon, life is a paradise most only dream about. But today paradise ends. The jungle has hatched more than idyllic love. It has also spawned insidious evil. An evil shrouded in a plot so diabolically brilliant that all of America will be brought to her knees at the hands of a few terrorists. The plan is executed to perfection; America's worst fears have dawned. Nothing stands in the way of terrible destruction. Except for the love of one woman. Step into the pages of a story taken from tomorrow's headlines. A story about the true power found in the face of all our fears. The power of love. 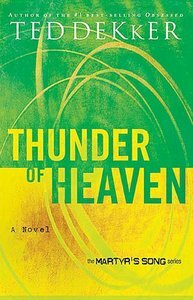 About "Thunder of Heaven (#03 in Martyr's Song Series)"
Kent Anthony is a brilliant software engineer who is cashing in on a brilliant career. He's finally living the idyllic life, far from thoughts of theft and murder and other kinds of horrible criminal behavior. He's left his past far behind . . . or so he thinks.